Dance by nature is collaborative — between dancers and choreographers, music and movement, and performers and the audience. 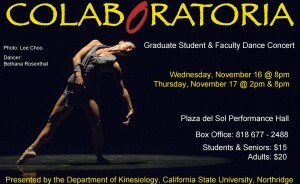 California State University, Northridge’s Department of Kinesiology will be sponsoring “Colaboratoria: Graduate Student and Faculty Dance Concert” at 8 p.m. on Wednesday, Nov. 16, and 2 p.m. and 8 p.m. on Thursday, Nov. 17, in the Plaza del Sol Performance Hall, located on the east side of campus at 18111 Nordhoff St., Northridge. The concert will feature 10 pieces, ranging from contemporary to hip-hop, lighthearted to serious and reflective dances. The new works reflect the choreographers’ aesthetic explorations and reflect their current interests in this time of change and uncertainty. Thomson said she is looking forward to having alumni choreographers such as Elissa Brock, Bebe Liang, Frances Maurer and Allen Chung. Liang works for an independent dance company and is a former figure skater who took 5th place in the U.S. Figure Skating Championships. Maurer and Chung plan to open a dance company for the American Sign Language community in the future.